Recent media research points to a trend: U.S. consumers are using tablets or smartphones at the exact same time they watch television. Nielsen reports that TV use is still high in the U.S., with the average Joe or Jane watching 4 hours and 38 minutes per day. However, sales of smart devices spiked (again) this Christmas, and 85% of smartphone/tablet owners have reported using these gizmos while the TV blares in the background. This “concurrent media use” creates a big challenge for advertisers — what is the best way to reach consumers who are using two devices at the same time? 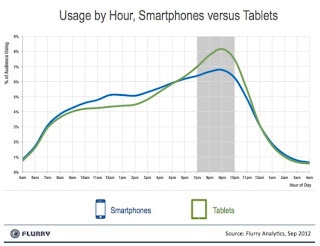 Because when the :30 second spot airs on television, usage of other devices in the consumers’ laps increases as they ignore the commercial interruption. When ads come on TV, consumers are looking away. Flurry, a mobile-data company, scoured observations on 6 billion app sessions on 500 million smart devices in September and found something interesting: The time consumers use tablets and smartphones mirrors that of traditional television viewing almost exactly, but what consumers do on these gadgets is much different. Smart device usage rises from 7 to 10 p.m., matching peak TV viewing almost exactly (in the U.S., television prime time is 7 to 10 p.m. Central and Mountain, or 8 to 11 p.m. Eastern and Pacific). So far, so good — the TV is on and the tablet is in the lap. 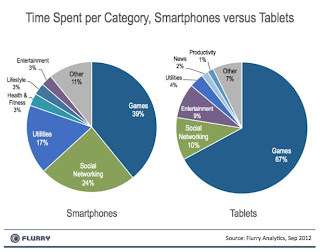 67% of tablet use is for games, 10% for social media, and only 9 percent falls into the “entertainment” category — of which video-viewing is a subset. So an advertiser running a television commercial on ABC can’t just also run the same video spot on ABC.com hoping a tablet user is concurrently watching the video feed on her lap — because while the ABC programming is on TV, the consumer is likely playing the game Angry Birds on her iPad. This finding is problematic for media buyers, because it shows duplicating the message from TV to a tablet environment for a concurrent impression is difficult … unless you recognize the consumers are doing something very different on these secondary devices. Rather than mirroring a message from one medium to another, marketers will need to create a strong secondary stream buying across mobile app networks where the message is reinforced within in-game advertising, as well as paid social media ads. Yes, you can still mirror TV spots in online video — and this can work very well in driving response — but if your strategy is to hit consumers at the exact moment of concurrent media use, you’ll need to add apps, games and social channels … or odds are you’ll miss the dual-media moment.